This post is long overdue, but I still decided to share it. These are from camp... I rode a horse named Grappa, aka the best horse ever! All my tent-mates were amazing and just all in all, camp is amazing. The first lesson with Grappa (we rode twice a day) he was really bad, and stuborn. I could barely get him to trot. But, all the other lessons, once he learned he couldn't get away with it, he was fantastic. Like, AWESOME. He would do whatever I asked, and he's also an AMAZING jumper. So, it was perfect. BUT, the last time I rode him, when my dad was watching, it was like we presses Rewind to the first lesson. It was trying to get a rock to jump. He didn't pay any attention to my leg or anything. It was really really disappointing. We were going to jump "the course" for the demo, which was like 10 jumps in a course that were all really high and there were triples and everything, but 8 classes wanted to do it for the demo, and only 3 could, so our group wasn't picked. SO, we had to do a stupid cavaletti course, which everyone was mad about. 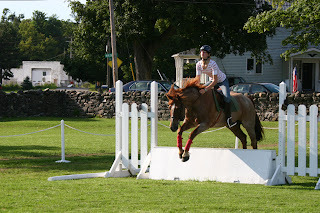 But, we were able to go into the jump course ring and jump "the wall." That's the third picture up there. ^^ I look really weird, because I could barely get him over it, it was so hard. I was exhausted and dissapointed. My good-byes were really sad, I didn't want to go. 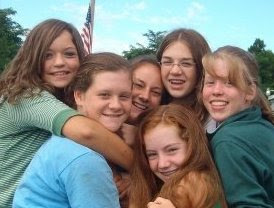 I had made such awesome friends. And Grappa. 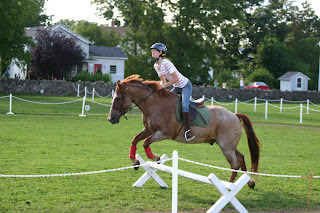 I rode Grappa two years ago at camp too, he's just so cool. Looks like a lot of fun! I love the one of you kissing Grappa on the muzzle, and the one of you and him swimming (I wanna do that!!). Wow! That looks like a lot of fun!! WOW, great pictures! Looks really fun! Omg! That looks like it was so much fun!